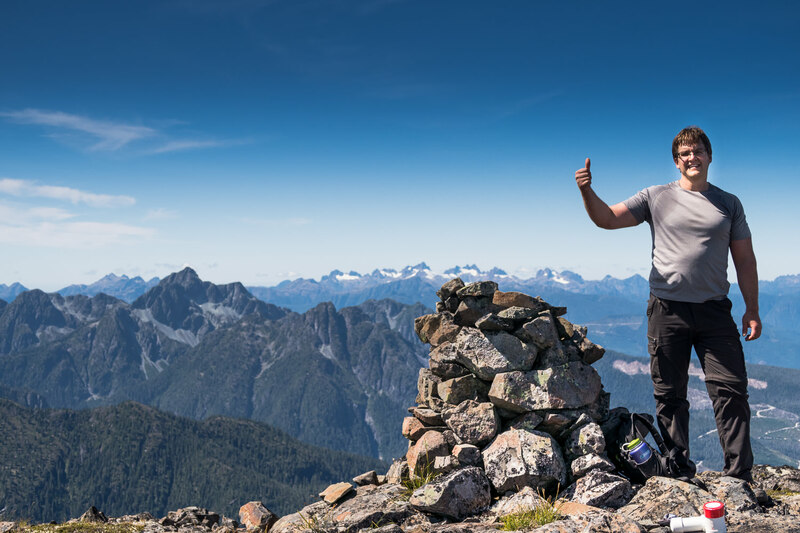 On my quest for the Island’s six-thousanders , Mount Schoen was still on my list of unvisited mountains; for reasons that will become obvious, I won’t refer to this summit as a peak. 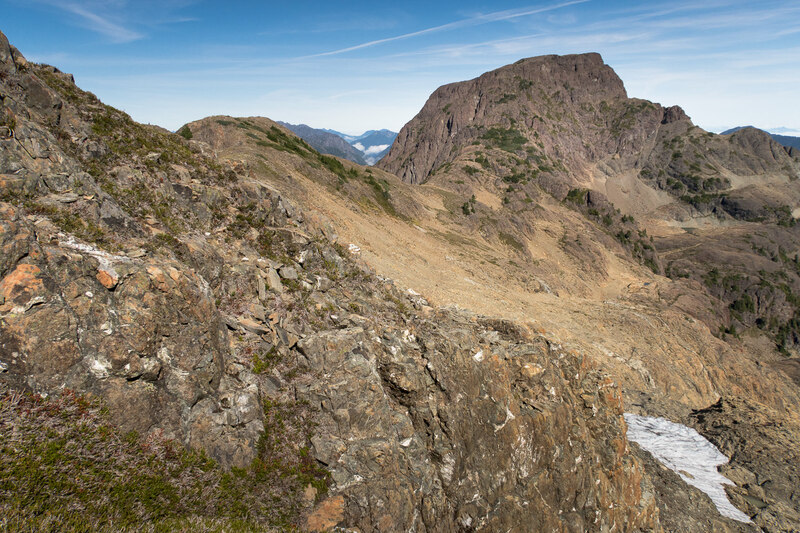 This north-island mountain sits overlooking the boarder of the Lake Schoen Provincial park. 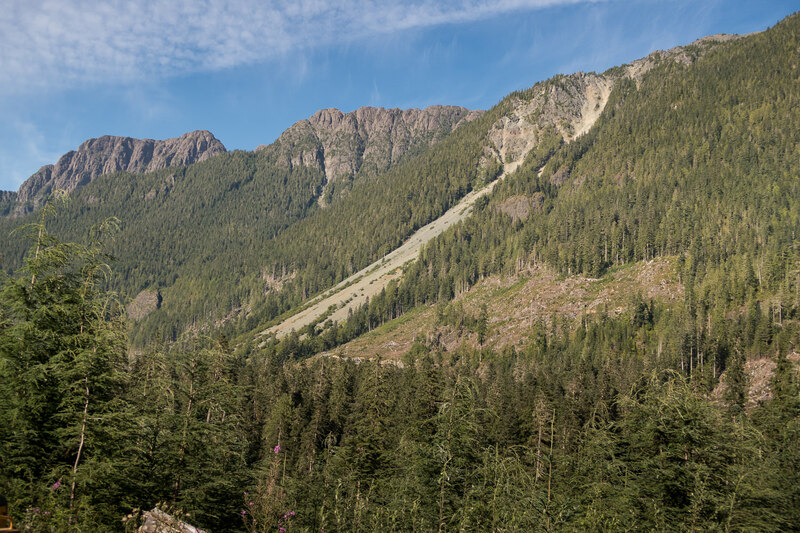 Though the park is well marked and accessed via Davie Road off highway 19 (between Sayward and Woss), our route is accessed via a different road. There are a number of approach routes to this mountain, we used the huge scree slope that leads to Adam Ridge. 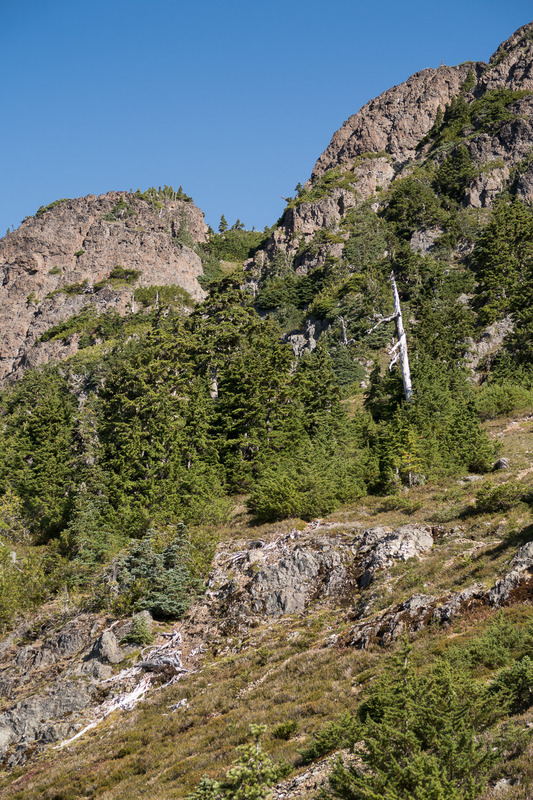 This route has a lot of elevation gain and loss as you follow a series of connecting ridges. The views are clear, making it easy to pick a route through this seldom visited mountain and though at times it can be bushy is mostly easy to navigate and features class 3/4 routes that are mostly free from exposure. Phil and myself chose Schoen because of the excellent beta provided by island-mountaineer-extraordinaire Lindsay Elms. 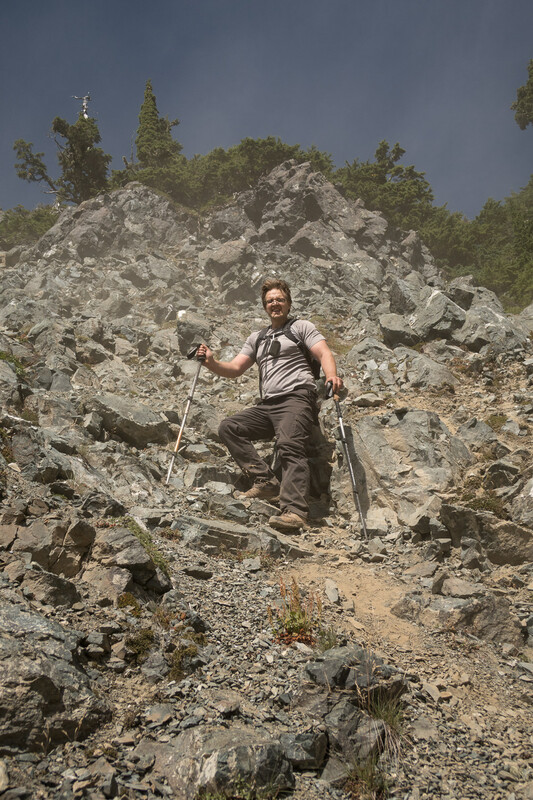 When he posted images of his recent trip, we caught one look at the massive scree slope and decided that we had to give it a go! The access roads are quick to drive and easy to navigate, they are all marked. Turn off Highway 19 at the Mt Cain/Schoen Lake turnoff, 10 km before Woss. Then turn right onto the Woss/Gold River road (straight ahead would be to Cain). Follow down the road and turn left (before Klaklakama Lake) onto Schoen Road (obvious) and then just follow that for 19 km (always take the left fork but it’s well signed). 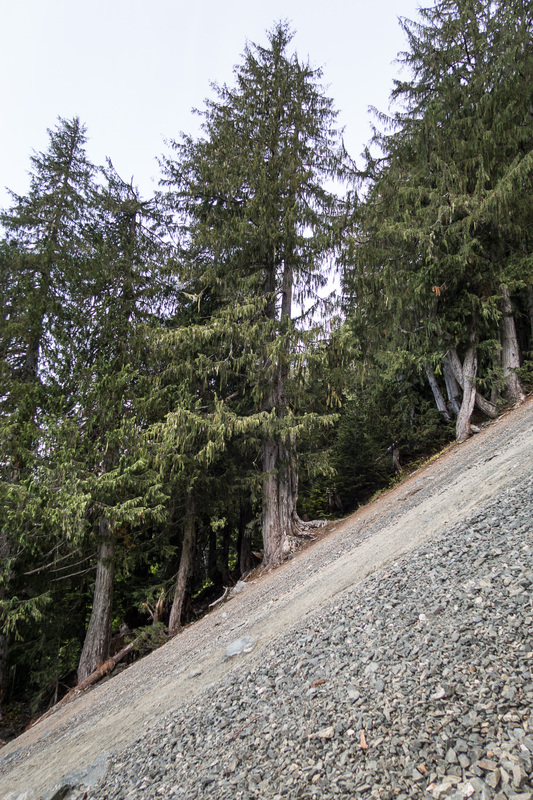 As you drive, the big scree slope becomes visible on the left. August 15, 2015, we drove up island and camped at the end of the road, enjoying the night sounds of a small herd of elk running through the woods and smaller creatures calling out in the night. 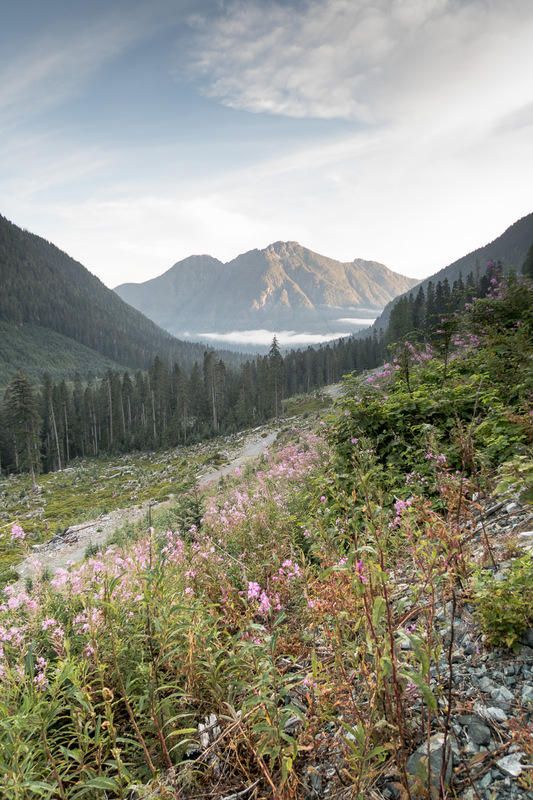 Early in the morning, we packed our camp ate our breakfast and head out into the dim light of the early morning, past the massive washouts to the end of the road (670 m), where we found elk-trails that lead up through the fireweed and slash filled slopes, sidling up along a dry creek bed. Following this route we made quick progress to 725 m where we spotted a fallen tree crossing the dry creek bed. 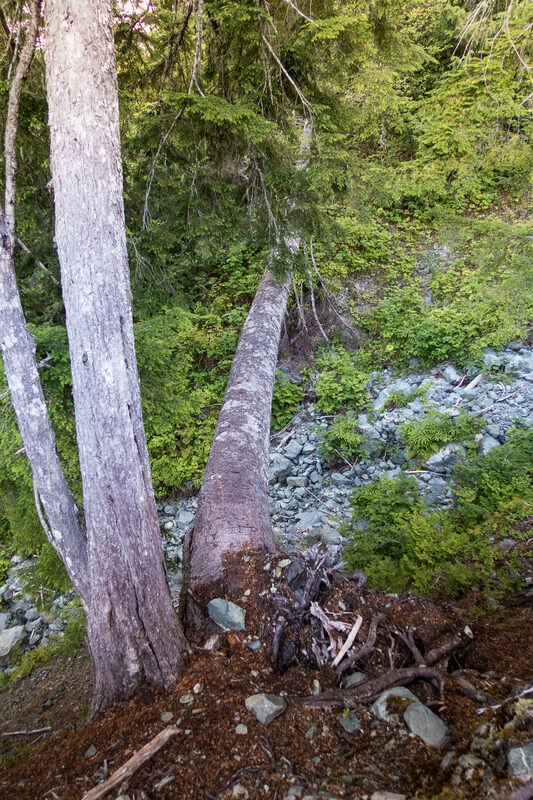 We used this as a marker to cross the gully to the strip of old growth on the other side. 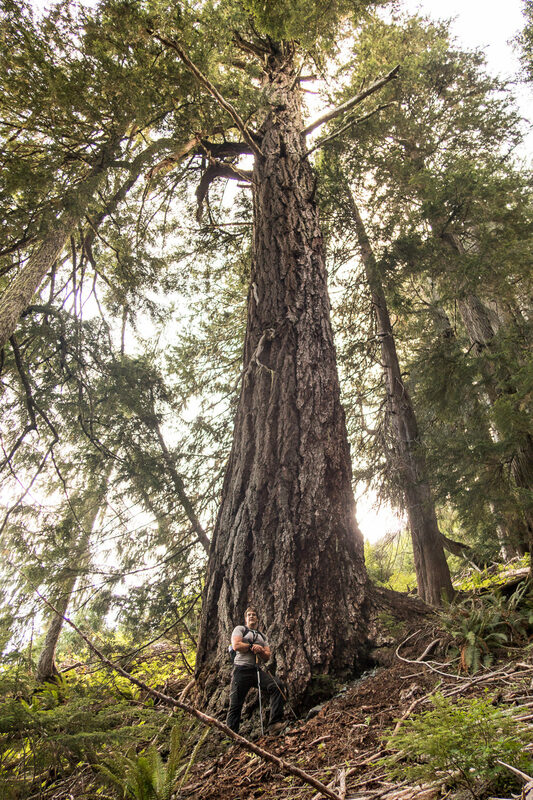 Following the old growth, the route took us past two notable trees, a giant Western Red Cedar and the biggest Douglas Fir I have been next to in a long while. If you were to follow my route, the terrain gets steep and requires the hiker to scramble along one rocky slope before cutting left and exiting onto the scree slope, around 900 meters. The view of the scree slope is dramatic, we admired the huge run-out and the elevation we had yet to gain! We followed the scree slope for 500-600 metres of elevation to gain Adam Ridge (close to 1500 m). The roughest section of the scree slope are the uppermost 100 metres, as we climbed there were two spontaneous rock slides that sent heavy rocks down the slope past us. The terrain close to the top is filled with piles of rotten rock and the scree sits atop hard packed earth which makes it slippery and difficult to navigate. This is not the scree of the rocky mountains, beautiful to walk in. This is a slippery slope to roadrash from hell or worse. To be honest, the up was much better than the down. Once up the slope, avoid summiting the ridge top, turn left (north) and follow the crowberry (Empetrum nigrum) and heather to the long (150 m ) drop via an easy hiking slope into the meadow col between Adam Ridge and the connecting ridge that leads to Mount Schoen. Take a moment before descending, inspect the route ahead of you. We hiked left of the centre line, following a greenway. At the bottom of the slope you’ll find a pristine meadow, it’s so idyllic that even a large bear couldn’t resist its charm. We hooted and hollered to push the bear along. It politely obliged and we completed our descent and started up the green-way toward the higher scree slopes that would give access to the top the final connecting ridge. Following the trees will take you to a short scree and bolder gully, clearly visible if you examined the route from Adam Ridge. The gully is easy to navigate but it is possible to send rocks down on people coming up below you, be cautious and take your time. The route is mostly easy hiking but there are a spot of two of class three (maybe 4) before you get to the top of the connecting ridge. 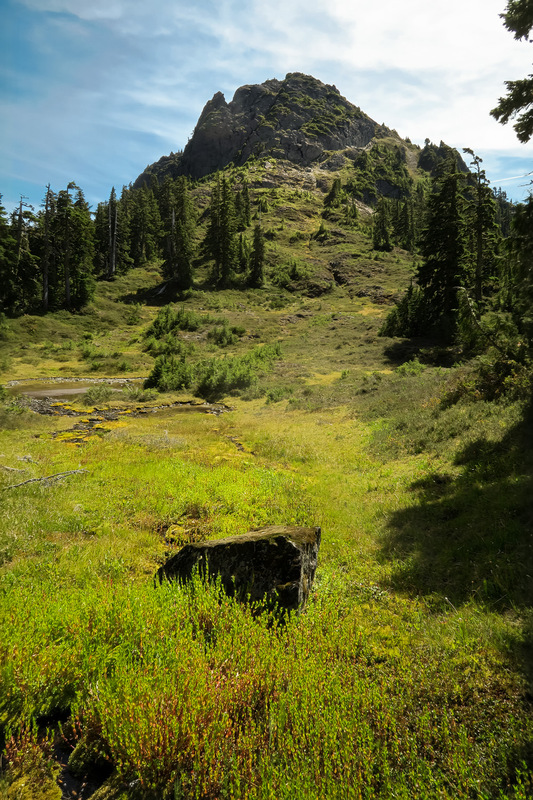 From the meadow, you climb 350 metres to gain the ridge summit (~1700m). From the connecting ridge the route is straight forward, though it may look daunting it is a nice scramble. There are a series of short bumps before you get to the final summit massif. We tried looking for a route around them and decided it was just as fast to walk the tops of the bumps and enjoy the views. Below the bumps there is a snow field, we left our crampons at home so we opted to avoid this route on the way to the summit, though it may have been more direct the time to put crampons on and off likely would save no time. The final massif has cairns and a lightly flagged route to remind you that you are not the first visitors. The final climb was over solid rock with good holds and the route was easy to follow, if not exactly obvious. Eventually, this leads out to the summit, the broadest of any island peak i’v set foot on. The talus plateau is easy to walk and we easily made it to the large cairn, complete with two registers. We took longer than expected on our hike up so we didn’t laze on the summit for long before packing our gear and returning to the car. On our return route the biggest challenge was sending rock and debris down the scree slope onto each other. At one point I tried using the forest beside the scree slope but it too was slow, though I didn’t fear dropping rock on Phil. Ultimately, we returned to the scree. I wonder if it’s possible to avoid climbing up the scree slope to gain Adam Ridge. 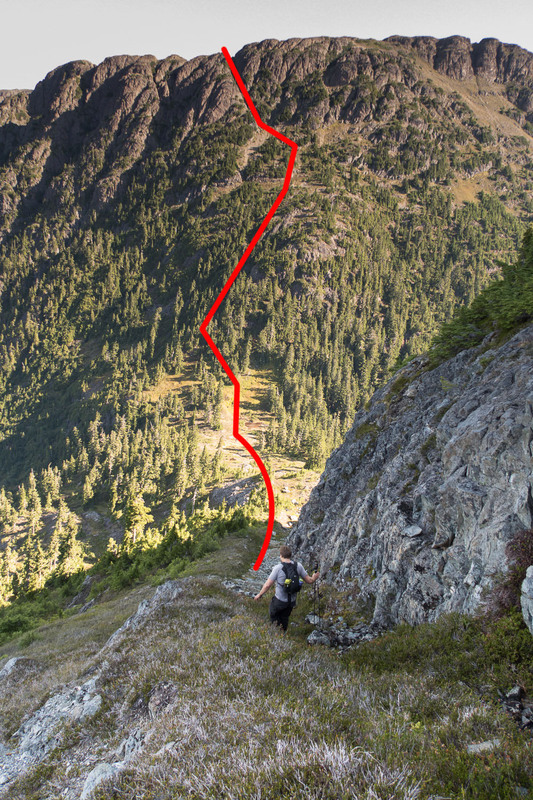 I would love to hear in the comments from anyone that has done this route and managed to avoid the scree. We made it back to the car by 530, safe and dusty… so dusty. As I sat changing my footwear I heard the unmistakable sound of a midair collision between two flying insects. I caught this fight to the death between a wasp and a deer fly. Thanks Matt. Helpful. I’ve heard so much evil about that scree slope that we’re going to try from the opposite, East side, (below Adam) gaining the South east ridge first, then cutting the corner through a cirque to the south ridge, first col. Hopefully it goes. I can let you know. Absolutely amazing. I camped by Schoen Lake in July 2017 and found it absolutely amazing. Wasn’t prepared for a hike but reading your post has inspired me to try sometime in the future. You’ve read my post so you know that I definitely recommend it!